KSRP Karnataka Special Reserve Police Constable 517 Online Apply last date : Karnataka State Police Department has released a fresh job notification in order to hire Special reserve Police constables only men. At this time it is going to fill 517 vacancies of constables- 517 Special Reserve Police Constable Jobs in Karnataka State Police. Last Dt. 24/08/2018. Karnataka Special Reserve Police (KSRP) Constable 517 Online Registration. KSRP Recruitment 2018 Apply Online 517 Police Constable Vacancy list. The Karnataka State Police has Announced KSP 517 Special Reserve Police Constable Vacancy. The interested and Eligible Candidates are Apply KSP Recruitment 2018 Online Application Form before 24th August 2018. Candidates Keep Your Mind Eligibility Criteria, Like Age Limit, Education Qualification and Other Skills According to KSP Special Reserve Police Constable Bharti 2018. Educational and Qualification: SSLC from recognized Board or equivalent. Minimum 18 year’s and maximum 25 years as on 24/08/2018. Only Male candidates are eligible to apply. Upper Age Relaxations: Upper age limit is relaxable by 02 years for SC/ST/CAT-01/2A/2B/3A/3B and 05 years for the Tribal category. (i) Height: 170 cms (155 cms for Tribal candidates); Chest (unexpanded): 81 cms (70 cms for Tribal); Chest (expanded): 86 cms (75 cms for Tribal). Candidates must pay Rs.250/- (Rs.100/- for SSC/ST/CAT-01 & Tribal) as Application Fee. The fee can be paid through Post Office only by means of Fee Payment Challan. Fee Challan can be downloaded from the official website of Karnataka State Police Recruitment. See officially released advertisement for more details. Scroll down and search for the “APPLICATION FOR THE POST OF SPECIAL RESERVE POLICE CONSTABLE(KSRP) (MEN)- 2018” Click on Register that link. One new tab will and select “New Application” and click on that. Enter your details and click on to register. Here the direct link to apply online application Karnataka Special Reserve Police (KERP) Constable 517 Online Registration. Note : BEFORE GOING TO NEW APPLICATION , APPLICANTS ARE ADVISED TO GO THROUGH /READ NOTIFICATION, ONLINE INSTRUCTION & BROCHURE CAREFULLY. 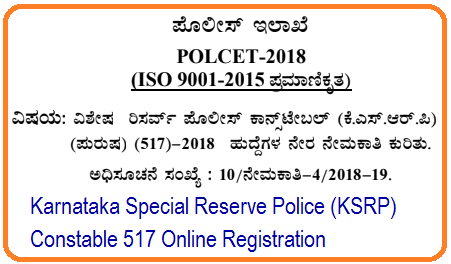 Download Karnataka Special Reserve Police (KSRP) Constable 517 Notification pdf. KSRP Karnataka Special Reserve Police Constable 517 Online Apply last date, KSRP Recruitment 2018 Apply Online 517 Police Constable Vacancy list.